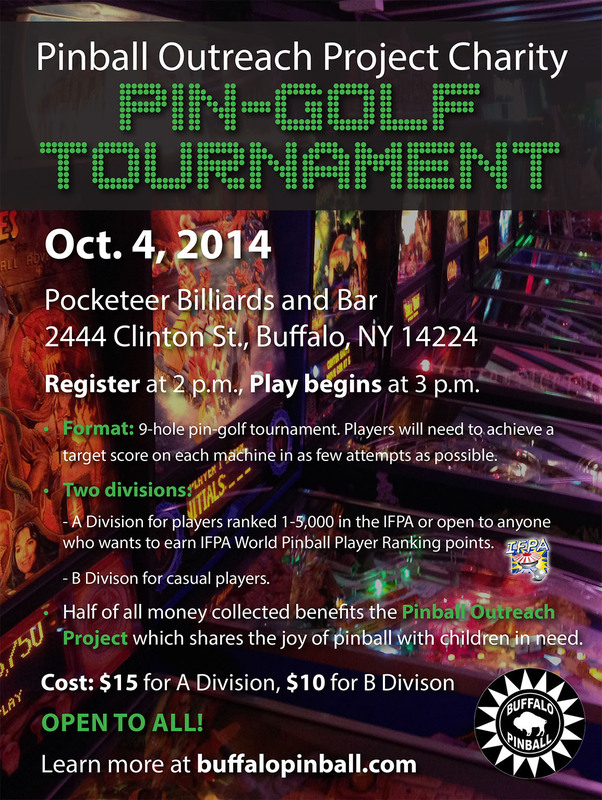 When: Saturday, Oct. 4, 2014 • Register at 2 p.m., play begins at 3 p.m. Format: Format: 9 hole pin-golf tournament. Players strive to achieve a target score on each machine. For example, if the target score is reached on the 1st ball, the player gets a “1” for that machine. The 2nd ball, a “2”. The 3rd, a “3”. If the player fails to achieve the target score, he/she gets a “4” for that machine. 9 machines will be played in total and the player with the lowest score total for the tournament will be the winner. If a player achieves the target score on a machine in less than 3 balls, the player does not have to play the rest of the balls. That player is done with the machine and will move onto the next machine (with his/her group). If 3 balls are played and the target score is not reached, the player is then finished with that machine and moves on to the next machine (with his/her group). Total time of tournament is expected to be less than 2 hours. No playoffs, only tie-breakers. – A Division for players ranked 1-5,000 in the IFPA or open to anyone who wants to earn IFPA World Pinball Player Ranking points. – B Division for casual players. Half of all money collected will benefit the Pinball Outreach Project, which shares the joy of pinball with children in need. Cost: $15 for A Division, $10 for B Division. Games will be on coin drop so be sure to bring money to play the games as well. This entry was posted in Tournaments on September 4, 2014 by k3v2.